He is director and principal consultant with 35 years’ experience in arboriculture. Neville is an expert witness in personal injury and tree related environmental damage cases. He established the Practice in 1990 as a nationally recognised, forward thinking and dynamic approach to arboricultural consultancy and client support services. He collaboratively developed an approach to Conservation Arboriculture, becoming one of the world’s leading experts in veteran trees. He specialises in sustainable care and management of individual and populations of trees in relation to their habitat and eco-systems, also working assiduously to support clients in developing a balanced and proportionate policy for managing trees and public safety risk. Neville provides training and supports policy development for land owners, advisors and managers including The Royal Parks, English Heritage, Scottish Natural Heritage, City of London and local authorities. 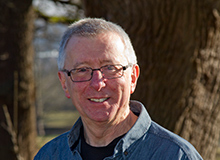 He founded the ‘Innovations in Arboriculture’ seminar series introducing world class speakers to deliver new and holistic approaches to the tree sector. He works with laboratories and landowners to better understand the relationship between trees, their root and soil condition, to improve mature and veteran tree resilience in the face of stress and disease. Neville is a visiting academic at Middlesex University. He lectures and publishes on trees, ecosystem and sustainable management. He co-devised ‘The Specialist Survey Method’ (SSM) – the national standard for surveying veteran trees, he also co-authored ‘Veteran Trees – a guide to risk and responsibility’ and ‘Tree Surveys: a guide to good practice’ and has recently contributed to ‘Gardens & landscapes in historic building conservation’ (ed. Marion Harney). His commitment to Treework Environmental Practice is consistent with the principles that led him to found Tree Aid (supporting community forestry in arid Africa) and with colleagues to found the Ancient Tree Forum, of which is he is a past chair.